Appliances are what we in the bidness call “electro-mechanical devices.” Oh yeah, mmm hmm, we professionals can throw around all kinda two-dollah words like that– that’s why we makes the big money! Anyway, “electro-mechanical” just means that they have both electrical and mechanical components, any of which can fail and require troubleshooting and repair. So, on any given service call, there’s at least a 50% chance that you’ll need to troubleshoot an electrical circuit to figger out why that washer ain’t washin’, that dryer ain’t dryin’, that dishwasher ain’t dishin’…. well, you get the idear. To troubleshoot electrical circuits, we use either a wiring diagram or schematic (or both) that come with the appliance. These diagrams are usually included with the tech sheet that’s carefully and cleverly hidden inside the appliance, safely out of sight of owners who usually just end up losing it if they happen to stumble on it. If you’re working on an electrical problem and you don’t have the wiring or schematic diagram, it’s like trying to drive around an unfamiliar city without a map. Gotta have it! 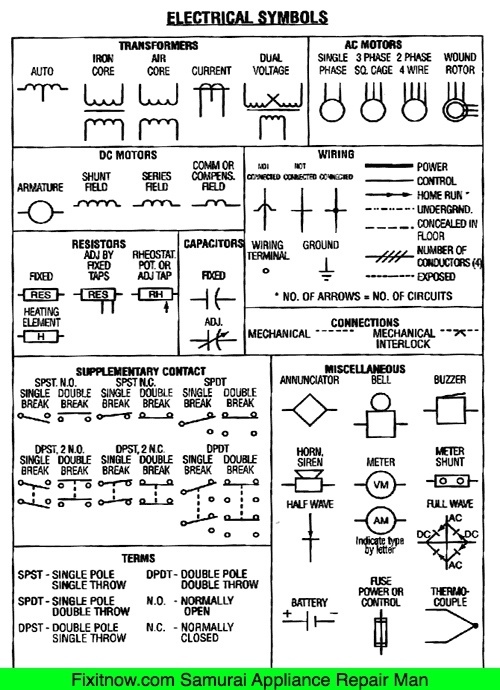 And really, that’s all a schematic or wiring diagram is: a road map for electrons. If you can learn how to use a street map, you can learn how to use a wiring diagram. Just like in a street map, you have to know what the symbols mean in order to understand what the map is telling you. Same deal with a wiring diagram or schematic. 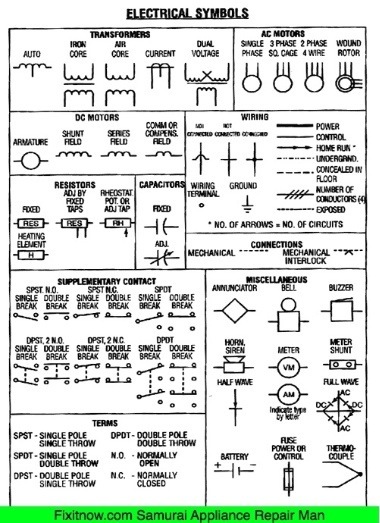 To help you get started learning how to read circuit diagrams, here’s a handy legend of common symbols used on electrical diagrams. It’s not comprehensive– there’s a bunch of stuff that’s not there– but this’ll get you started. Click it for the larger version. This entry was posted in General Appliance Wisdom on May 27, 2009 by Samurai Appliance Repair Man.